14“You are the light of the world—like a city on a hilltop that cannot be hidden. 15 No one lights a lamp and then puts it under a basket. Instead, a lamp is placed on a stand, where it gives light to everyone in the house. 16 In the same way, let your good deeds shine out for all to see, so that everyone will praise your heavenly Father. The concept of uncrushable joy can be a difficult one. For me as I press into this concept I’m drawn to the separation between happiness and joy from an earlier entry in this series; that inevitable time in life when we are called to endure hardship and trials and yet in the midst of that pain be unshakable in our faith for the promised joy that is to come. Some may ask “how is that even possible?” when this topic comes up. I think it is multi-faceted but all leads back to the same Truth. There are many times when our emotions lie to us; an event in the present that isn’t that big of deal becomes overwhelming emotionally and we react over-the-top. We are hurt, we become angry, indignant, resentful. For me those can come up like a flood but through studying scripture, being in recovery courses, and relying on friends who know me very well I am often reminded that the current situation mirrors a previous trauma and in that I can CHOOSE to not over-react. Road rage is a good example of that for me. I’m going through life minding my own business then some selfish… “person” (not the description I wanted to use) decides using the shoulder to pass me on the right is a good idea in rush hour traffic just to get hard on the brakes in front of me because there was nowhere to go. Yes that is unsafe and on some reasonable level anger or frustration for fear of safety is warranted. But I promise the amount of hate, the rise in blood pressure, the fixated thoughts on wanting them to get in a solo accident with a tree are not Light bearing. Or a car being stolen, or someone else getting a promotion over us, or a flat tire, or (enter your smallish-trial here). These things are a disruption in a fallen world meant to dim our light however the power of Christ in those times comes in knowing that this event, this encounter, this person, this day, even this life is trivial compared to the eternal joy we will spend with God. That is the key through which we are given the ability to refocus on the calling He has placed upon us in this life to be Light bearers. The renewal of our mind is what is required. To have the intellectual awareness of the promises and word of God so entrenched within our soul that nothing formed against us shall prosper. Yes, I agree that when the trials get harder our eternal vision must be that much stronger; the medical diagnosis that is terminal or the tragic loss of a loved one. These transcend the temporal problems of day-to-day living and draw us directly into the battle of life and death and true and deep suffering; our own or another’s. How can joy be on our lips and heart in the midst of this? The same solution applies which is an eternal perspective. When our problems are beyond earthly resolution there must be a relentless vision of what lies ahead for all of us who call on Christ for salvation. No, in all these things we are more than conquerors through him who loved us. 38 For I am convinced that neither death nor life, neither angels nor demons, neither the present nor the future, nor any powers, 39 neither height nor depth, nor anything else in all creation, will be able to separate us from the love of God that is in Christ Jesus our Lord. To stay focused and rooted in the eternal is the secret to rising above anything that this broken world or our feeble flesh throws at us. We are loved, cared for, encouraged by, and saved personally by the Creator of all things in heaven and earth; His love will endure forever and He has already purchased our ticket to eternal and unending joy. 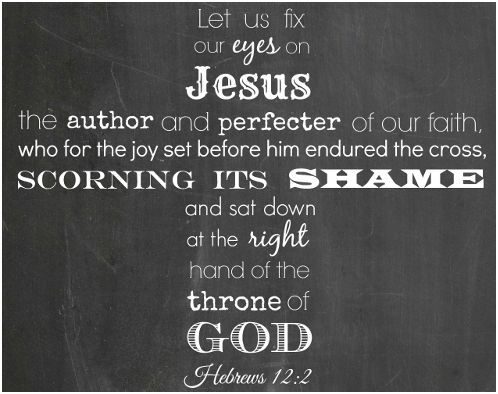 What will our focus be on today; our problems or our Savior. How does knowing the one who holds the future keep me from drifting into despair? What light do I need to focus on to stay on the journey of joy? Where do I need to place my anchor to keep from drifting off course? Lord, to drift into the painful subject of suffering this morning and reflect upon those events in my life both small and large in the light of this mornings study of Your Word I can so clearly see the times in my life where I lost sight of you and fell into despair, rage or resentfulness and see the stark contrast of those times when I was under Your heavenly spell of eternal joy and found myself praying for others in those times instead of myself. It all comes down to what I’m focus upon Father – YOU or anything else? Today Lord Jesus I seek only to focus on Your light so that I might be even a reflection to this fallen world of the uncrushable joy You offer to all who call upon Your name. Thank you Jesus for this new day. This entry was posted in bible study, encouragement, faith, hope, Jesus, Joy, love, trials and tagged anger, eternity, fear, hope, jesus, joy, more than conquerer, resentment, salvation. Bookmark the permalink.